The RABDF and University of Bristol have carried out research into farmers’ opinions on antibiotic reduction on their farms. A survey carried out by the RABDF, in conjunction with the University of Bristol, found dairy farmers believed it would be possible to reduce antibiotic usage by one third in dry cow therapy, and by one fifth in clinical mastitis within the next five years. In response to the O’Neill Review on Antimicrobial Resistance, published this spring outing recommendations for global antibiotic usage, it is expected the administration of critically important antibiotics to livestock will be restricted, if not banned in the future. During a press briefing at the Farmers Club, Dr Kristen Reyher, senior lecturer at University of Bristol that after analysing their survey’s results, she was very encouraged by farmers’ recognition of their need to reduce useage. She said: “We need to encourage best practice of antibiotics with the safeguarding of animal health and welfare, while the regulatory oversight of veterinary antibiotics significantly increases. Dr Reyher regarded the best method to encourage the reduction of antibiotic administration on farms was via farmer-to-farmer communications, rather than a consultant led strategy. Research from the University of Bristol suggested sometimes vets felt pressure into prescribing antibiotics, knowing they are not necessarily needed. Di Wastenage, RABDF council member and South West dairy farmer said: “I think we need to be making changes on farm as quickly as possible around antibiotic useage, before we are made to, and I believe there is motivation for this coming down the supply chain. “If we are going to create a database detailing antibiotic use, it needs to be done quickly and anonymously to encourage people to work together. “Vets also play a pivotal part in this as well as the manufacturers and clear labelling is vital, so farmers understand what type of antibiotic they are using. 322 respondents from across the UK, with 93 per cent being farmers, of which 64 per cent were dairy farmers, 25 per cent beef farmers, 10 per cent other livestock producers and the remainder did not specify. Other than farmers, students, farm and herd managers and vets also responded. Result findings will be fed into existing industry-wide initiatives, including RUMA and CHAWG, while the RABDF itself will take some ‘important calls to action’. Three quarters of their respondents said their milk buyer was starting to ask questions surrounding useage. 90 per cent believe the farming industry must take a proactive approach to antibiotic resistance. A 20 per cent decrease in clinical mastitis in milking cows was thought achievable. 97 per cent thought the antibiotic resistance crisis was something they should be playing part in. 88 per cent believed reductions needed to occur before they became compulsory. 40 per cent were making some sort of electronic record – making the development of an industry-wide database a quicker process. 85 per cent thought they could refine and reduce their own use of antibiotics. Within five years, respondents said they could reduce dry cow therapy by 30 per cent, clinical mastitis antibiotic use by 20 per cent and in treating calves by 15 per cent. 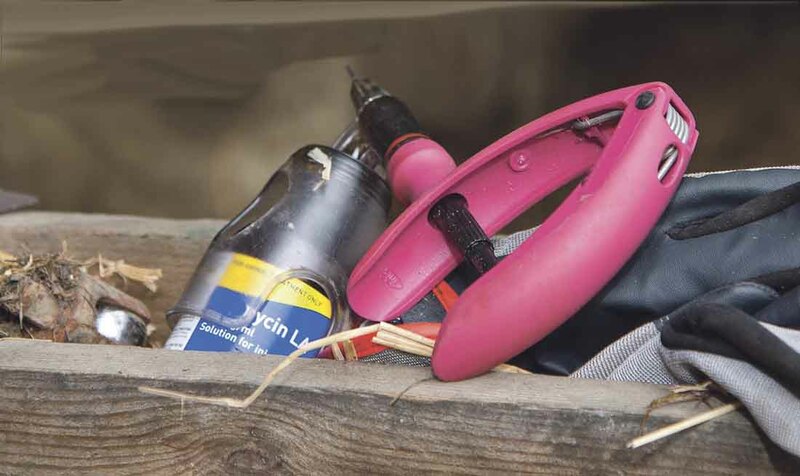 52 per cent of farmers received recommendations from their vet on reduction in total antibiotic use, with a similar percentage receiving veterinary advice specifically on critically important antibiotic use.